As compared to traditional packaging, current packaging solutions are used for transferring cash or coins from one place to another. Cash-in transit bags offer added value and features such as being highly secure, reusable, and biodegradable. They also have tamper evident security seals. Cash- in transit bags are bags that are used to carry currency from one place to another. Rising concerns about safe and secure movement of cash from one place to another is resulting in the rise in demand for cash- in transit bags. Currently, manufacturers of cash-in transit bags are more focused on using material that is less toxic, as consumers prefer more eco-friendly products. Growing risk of online fraud and cybercrime has boosted the need for robust security and safety concerns. Online fraud is increasing and spreading rapidly across geographies. However, financial institutions and merchants are investing to control online fraud activities through cash transfers, thereby driving the cash-in transit bags market over the forecast period. Rapid increase in installations of ATM in developing and emerging regions like Asia Pacific has also impacted the cash-in transit bags market. Currently, China is dominating in terms of ATMs installed followed by the U.S. Europe held the highest share in the cash- in transit bags market followed closely by Asia Pacific. Rapidly increasing demand for fast and convenient ways to transact and rising usage of mobile phones for payment across the world is expected to have a negative impact on the cash-in transit bags market during the forecast period. Contactless payment solutions come with the convenience of fast methods of payment, eliminating the need to carry cash or even worry about having enough cash to complete the transaction. Furthermore, cashless payment solutions do not require signing in or entering a PIN as compared to normal debit/credit card transaction, thus making the process swift. All these features are expected to hamper the growth of the cash-in transit bags market. On the basis of bag type, the cash- in transit bags market is classified into deposit bags, shipping bags, coin bags, strap bags, stock bags, and custom bags. The deposit bags segment has a huge potential in the cash-in transit bags market. The shipping bags segment is the second dominant market in terms of CAGR. Adoption of reusable bags and use of tamper evident bags are expected to provide opportunity, and enhanced cash-in transit bags provisioning and cash management. Based on material, plastic bags segment is expected to maintain the prominent market share during the forecast period. Manufacturers of these cash-in transit bags are inclined toward developing plastic security bags with a completely degradable film. Plastic bags are more secure and sustainable as compared to paper and fabric bags. All these factors are expected to drive the cash-in transit bags market during the forecast period. Under the end use segment, the retail and financial sector is expected to drive the cash- in transit bags market during the forecast period. There are various factors which are driving the cash-in transit market such as increasing number of financial institutions and retail stores across the world. Moreover, increased government investment in emerging sectors in developing economies has boosted the growth of the market. In term of CAGR, retail chains hold the first place followed by the hotel sector. Asia Pacific is expected to have the highest growth prospects for the cash-in transit bags market. India, China, Japan, and Australia are expected to drive the market during the forecast period. For example, in India, 0.83 billion people out of the total population of 1.21 billion reside in rural areas. In addition to this, the rural population transacts only with cash, as digital or cashless methods of transaction has still a long way to go. This factor offers a huge opportunity for the cash-in transit bags market in India. Growing risk of online fraud and cybercrime has led to the need for robust security and safety systems. This factor is anticipated to have positive impact on the cash-in transit bags market during the forecast period. This is due to increasing cash transaction and increasing online fraud and crime rate. As compared to Europe, Middle East & Africa, and South America are expected to witness a lower growth rate during the forecast period that is 2017 – 2025. Companies are focusing on achieving long-term growth through innovations. TruSeal (Pty) Ltd, Harcor Security Seals Pty Ltd, Adsure Packaging Ltd, ITW Envopak Limited, ProAmpac Holdings, LLC, Dynaflex Pvt. Ltd, KOROZO Ambalaj San.ve Tic A.S, The Versapak Group, Shields Bags & Printing Co, A. Rifkin Co., Nelmar Group, Packaging Horizons Corp, Initial Packaging Solution Ltd, Leghorn Group, Coveris Holdings S.A, Mega Fortris Group, and Amerplast Ltd. are the key companies active in the cash-in transit bags market. This report on the global cash-in transit bags market provides analysis for the period 2015–2025, wherein 2016 is the base year and the period from 2017 to 2025 is the forecast period. Data for 2015 has been included as historical information. 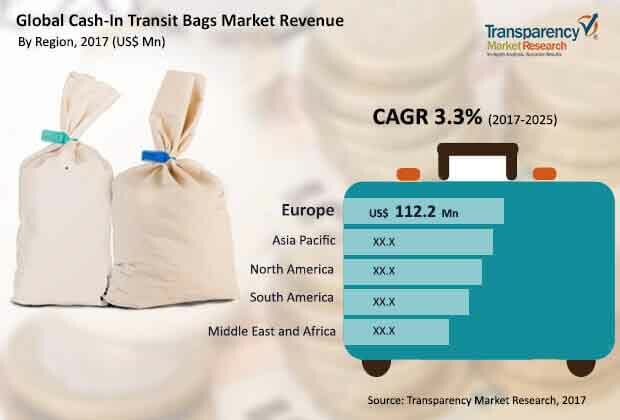 The report covers market dynamics including drivers, restraints, opportunities, trends, and policies and regulations which are expected to influence the cash-in transit bags market growth during the said period. The study provides a comprehensive analysis on market growth throughout the above forecast period in terms of value estimates (US$ Mn) and volume shipments (thousand units), across different geographies. Cash-in transit bags are bags that are used to carry currency from one place to another. Rising concerns about safe and secure movement of cash from one place to another is resulting in the rise in demand for cash- in transit bags. Consumers are inclined toward flexible and secure packaging solutions. Cash-in-transit bag manufacturers are turning toward reusable and biodegradable bags which are made of plastic. The cash-in transit bags market has been segmented on the basis of type, material, end-use, and geography. Based on type, the market has been segmented into deposit bags, shipping bags, coin bags, strap bags, stock bags, and custom bags. By material, the market is classified into plastic bags, paper bags, and fabric bags. Financial institutions, hospitals, casinos, hotels, retail chains, government organizations, courier services, and academic institutions are the end-use industries. Geographically, the report classifies the industry into North America, Europe, Asia Pacific (APAC), Middle East & Africa (MEA), and South America; the regions are analyzed in terms of value and volume shipments. Furthermore, prominent countries (region wise) covered in the report include the following – the U.S, Canada, Mexico, Germany, U.K., France, Switzerland, Russia, Spain, China, India, Japan, Australia, GCC, South Africa, Brazil, and Argentina. The report also includes key developments in the cash-in transit bags market. Porter’s Five Force analysis which identifies bargaining power of suppliers, bargaining power of buyers, threat from new entrants, threat from substitutes, and threat from competition is also included in the report. Value chain analysis which highlights work flow in the cash-in transit bags market and identifies raw material providers, and distribution channels of this industry is also covered in the report. Segment trends and regional trends have also been added in the report. It also covers segment wise incremental opportunity analysis and country wise econometric analysis (these include a country’s economic information covering population, GDP, labor cost analysis, disposable income per capita, and purchasing power parity). Furthermore, the scope of study also covers competition matrix of key players. Incremental opportunity analysis identifies and compares a segment’s attractiveness on the basis of CAGR and market share index across North America, Europe, Asia Pacific, Middle East & Africa, and South America. The same has also been provided for each segment i.e. by type, by material type, and by end-use. The report also includes competition landscape which includes competition matrix, market share analysis of major players based on their 2016 revenues, and profiles of major players. Competition matrix benchmarks leading players on the basis of their capabilities and potential to grow. Factors including market position, offerings, and R&D focus are attributed to a company’s capabilities. Top line growth, market share, segment growth, infrastructure facilities, and future outlook are attributed to a company’s potential to grow. This section also identifies and includes various recent developments undertaken by the leading players of the cash-In transit bags market. Company profiling includes company overview, major business strategies adopted, and key developments. The companies profiled in the global cash-in transit bags market include TruSeal (Pty) Ltd, Harcor Security Seals Pty Ltd, Adsure Packaging Ltd, ITW Envopak Limited, ProAmpac Holdings, LLC, Dynaflex Pvt. Ltd, KOROZO Ambalaj San.ve Tic A.S, The Versapak Group, Shields Bags & Printing Co, A. Rifkin Co., Nelmar Group, Packaging Horizons Corp, Initial Packaging Solutions Ltd, Leghorn Group, Coveris Holdings S.A, Mega Fortris Group, and Amerplast Ltd.